CARBONDALE, Ill. – The academic achievements of nearly 1,300 Southern Illinois University Carbondale students will be celebrated at fall 2018 commencement exercises on Dec. 15. 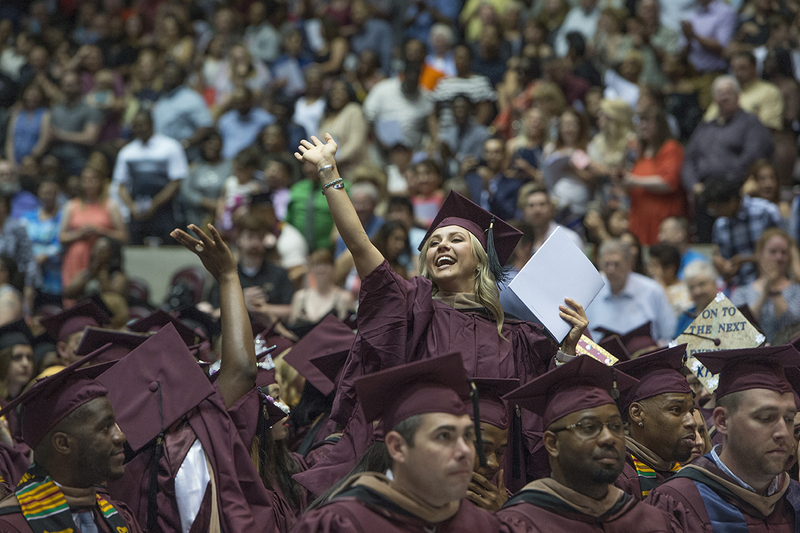 The commencement ceremony for all colleges including the SIU School of Law begins at 2 p.m. at the SIU Arena. As of Dec. 1, there are 1,270 candidates for degrees: 969 for bachelor’s degrees, 215 for master’s degrees, 59 for doctoral degrees, 10 for law degrees and 17 for associate degrees. Reporters, photographers and camera crews are welcome to attend the commencement ceremony. Interim SIU President J. Kevin Dorsey emphasizes that commencement is “so much more” than walking across a stage to receive a diploma. In addition to achieving a key milestone, commencement represents a students’ academic accomplishment and readiness for the next phase of their lives “whether it is joining a graduate program or pursuing employment,” Interim Provost and Vice Chancellor for Academic Affairs Meera Komarraju said. The commencement ceremony is open to the public and tickets are not required. More information is available at commencement.siu.edu. The ceremony will be available via livestream by clicking on the “Watch Live” button on the commencement.siu.edu website.